Lee Siebert has compiled data on the world's volcanoes since 1974 and was Director of the Smithsonian's Global Volcanism Program (GVP) from 2007 to 2010. Paul Kimberly joined the Smithsonian in 1995 and is currently GVP Program Manager. Tom Simkin (1933-2009), served as GVP founder and director from 1968-1995 in a distinguished career in volcanology that spanned more than four decades. 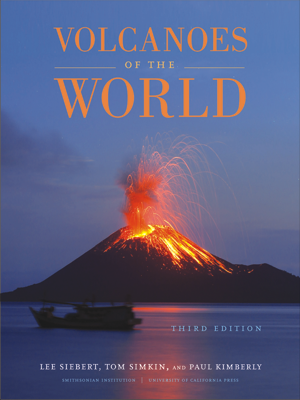 Siebert, L., Simkin, T., and Kimberly, P., 2010, Volcanoes of the World, 3rd ed. Berkeley: University of California Press, 568 p.